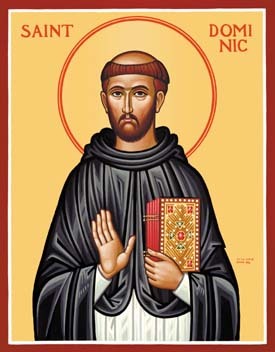 Today is the feast day of St. Dominic; he is the founder of the Order of Peachers, a missionary monastic order. St. Dominic was born in Spain in 1170. He was a priest and prior of the cannons of the cathedral chapter. In 1206 he accompanied his bishop on a visit to southern France, where they encountered a heretical group, the Albigeneses. Their innkeeper held to the teachings of the Albigeneses, Dominic stayed up all night talking with the innkeeper; by morning the innkeeper was ready to become an orthodox Christian. Dominic found his call that morning. He and the bishop dedicated themselves to the study of the Albigeneses teachings and debated their leaders in public debates. Dominic wanted to convert and teach people by peaceful means, rebuking them without force and showing them the light of the Gospel. In 1215 Dominic founded an order of preachers, who would live in poverty and devote themselves to the study of theology and philosophy. They would combat false doctrines with logical arguments and the example of their life; since the obstacle for many heretics was the material wealth of some of the clergy. So Dominic required the brothers of his order to live in poverty and simplicity, so they would be no better off than those they sought to convert. Dominic later traveled to Rome to seek authorization for his order of preachers. The Pope himself gave Dominic a tour of the Vatican treasures, supposedly saying “Peter can no longer say, ‘Silver and gold I have none.’” To which Dominic said, “No, and neither can he say, ‘Rise and walk.’” Because of the growing number of monastic orders the Pope asked Dominic to instead of constructing a new monastic rule to choose one of the existing ones and adapt it for his Order’s use. Dominic chose the Rule of St. Augustine. The Order of Preachers became official and grew. It has had some famous saints throughout the centuries, such as St. Thomas Aquinas, St. Catherine of Siena (a third order nun), and St. Albert the Great. This entry was posted in Lives of the Saints and tagged Feast Day, Order of Preachers, St. Dominic. Bookmark the permalink. Great post! My mother attended St. Catharine’s College, named after Catherine of Siena. We literally have Dominicans running all over the place in Washington Co.
Ꮋave you ever thought about including a little bit more tɦan juѕt your artiϲles?